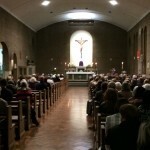 Over 200 people packed into St Bernadette’s Roman Catholic Church in Hillingdon on Friday Evening for a remembrance service led by parish priest Father Mathew Heslin. District Manager Adrian Moore together with funeral arrangers from Waldings in Uxbridge, Hillingdon Funeral Service, AV Smiths, and Lodge Brothers Yiewsley & Northolt all helped to create a wonderful service of remembrance for families we have helped during the year. Candles of remembrance were lit for loved ones whilst soloist Francesca Gash sang and names of loved ones were read out. This is an annual event and is always well attended. Mulled wine and warm mince pies were enjoyed by all.